According to Hemingway “Nobody goes to bed in Madrid until they have killed the night”. I had more tweaked it’s nose and ran away but sleeping above one of his old haunts meant I was entitled to a lie in. This meant that following guide book orders and getting to one of Madrid’s trio of world famous art galleries for opening time was unlikely. Similarly, I could think of other things to do than troop round them all twice. Time for a kind of speed dating attack which we might as well call “Death in the Afternoon” for the purposes of tying the opening paragraph up. Leaving the almost deserted environs of the rest of the gallery via the traditional route I was treated to a gift shop of almost Premier League football proportions. From fridge magnets to expensively framed prints and all points in between there seemed to be nothing that the “Guernica” couldn’t be plastered all over. From contentious art to a cushion cover in short. I prefer the splendidly named Javier Arce’s felt tip rendition on paper which can be crumpled into a ball as it seems to symbolize how these rarefied spaces dilute potency. 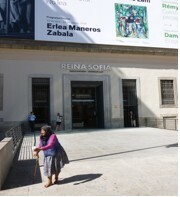 Thankfully it’s a short walk in thirty odd degrees for my next date in the mother of all Madrid’s stately art homes. The queue outside the Prado is stretching around the building so the Paseo del Arte ticket I bought earlier comes in well handy for shaving about an hour off my time. Feeling suitably smug and having decided to avoid scenes from the Bible or people in wigs I head straight for one corner of the ground floor to give Goya’s work the once over. 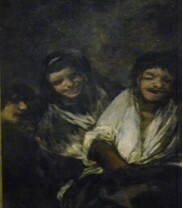 I am with the Chapman Brothers when it comes to Goya and whilst I haven’t managed to make a career from him did expect his Black Paintings to do it for me. Confronting them with an agitated woman whispering “I don’t see the point in any of this” to her companion wasn’t the scenario I envisaged but it’s Painter from “The Fast Show” wailing “Black” before a meltdown quality only enhanced my viewing experience. Performance art at its best. Some art is so powerful it can transcend any environment and the fourteen pictures hacked from the walls of Goya’s “House of the Deaf Man” certainly manage this. Moving into the property on the outskirts of Madrid at the age of 72 the disgust for humanity which was shaped by his experience of the Napoleonic Wars and reflected in his “Disasters of War” series is if anything cranked up a notch here. Perhaps it was concerns about his sanity or having no intention of exhibiting the work that liberated him to produce images of such visceral intensity as the pre Freudian “Saturn Devouring His Son”. Even so I would be lying if I didn’t say that even amongst all this the possible outbreak of “onanism” in “Two Women and a Man” hadn’t caught my eye. If you ever stop laughing at a man masturbating in an art gallery your time is up I always say. The smile was soon wiped off my face by establishing that “The Garden of Earthly Delights” had been moved into a temporary exhibition of Bosch’s work and now involved a whole new ticket rigmarole and a three hour wait I wasn’t about to countenance. This was particularly disappointing as I was looking forward to sharing my first experience of the picture anecdote. Oh go on then. I was off school at my Grandma’s pretending to be ill and being spoilt in the way which was as good as it got in the world of a six-year-old when a piece on Hieronymous came on one of the two channels on television. I can clearly remember the foreboding this caused and an all is not right with the world sensation that never went away. Clearly distressed I attempted to console myself with the image of the Prado information desk descending into an overheated tourist hell but still missed the entrance to the Thyssen gallery as I mistook it for a car park and added valuable minutes to my time. Once inside the gallery it was up the stairs to the first floor for Edward Hopper’s “Hotel Room”. 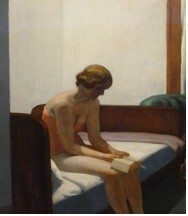 Being slightly less stuffy than the previous galleries enabled a quick reflection on this study of solitude in solitude. The look of his pictures has been appropriated by a thousand noir films whereas the house in “Psycho” was taken wholesale from one of his works. Maybe it is the cinematic connection which caused me to call him “Dennis” during one drunken conversation. 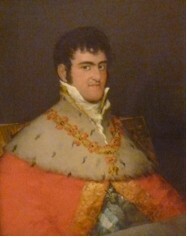 With scant regard for time I couldn’t resist looking in on bad boy Goya’s portrait of King Ferdinand the something of Spain. Looking utterly gormless and with the accoutrements of power restored by the British from the French looking like they might envelop him it is difficult to believe Goya isn’t ridiculing the monarchy. This over a century and a half before Jamie Reid stuck a safety pin through the Queen and the stakes were a little higher in Goya’s day. Now Baroness Thyssens greatest hits collection and less austere surroundings made for a more enjoyable experience than the other galleries but the blurb informing us of the importance of sharing these works didn’t sit so well. The concept obviously not extending to the wealth necessary for the best part of a billion-pound art collection accumulated by her deceased “resident” of Monaco for tax purposes husband. Given the commission for a portrait I’m not sure what sort of job Goya would have done but know what I would hope. Anyway that’s me done in a time of under four hours. I am not sure what the ultimate alternative to the gilded cages and shrines to money which jar with the art is but if you want to give my personal best a run for its money pick your targets and get in and out as quickly as possible. Just prick the pomposity and contradictions in the mainstream art world because after all there is a city out there just waiting to be assaulted.